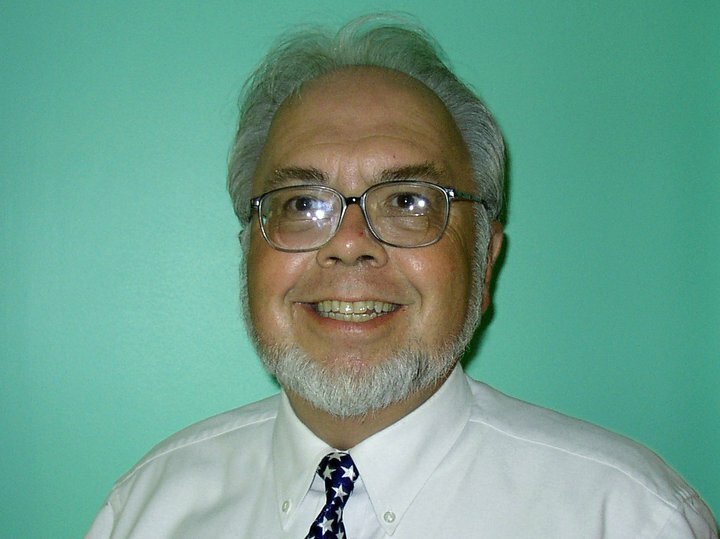 He certainly is the owner of and a “Process Server” at Ulrich Litigation Support LLC — But, is he an honorable New Hampshire State Representative? .. Or even an honorable Justice of the Peace? On June 12th 2016, I hired Jordan as a Process Server to serve papers on Maggie Hassan (Governor) and to deliver a letter to William Garder (Secretary of State). I hired Jordan because as a State Rep, Jordan goes to the State House where William and Maggie work and this was a just a way of supporting someone I thought deserved some appreciation. 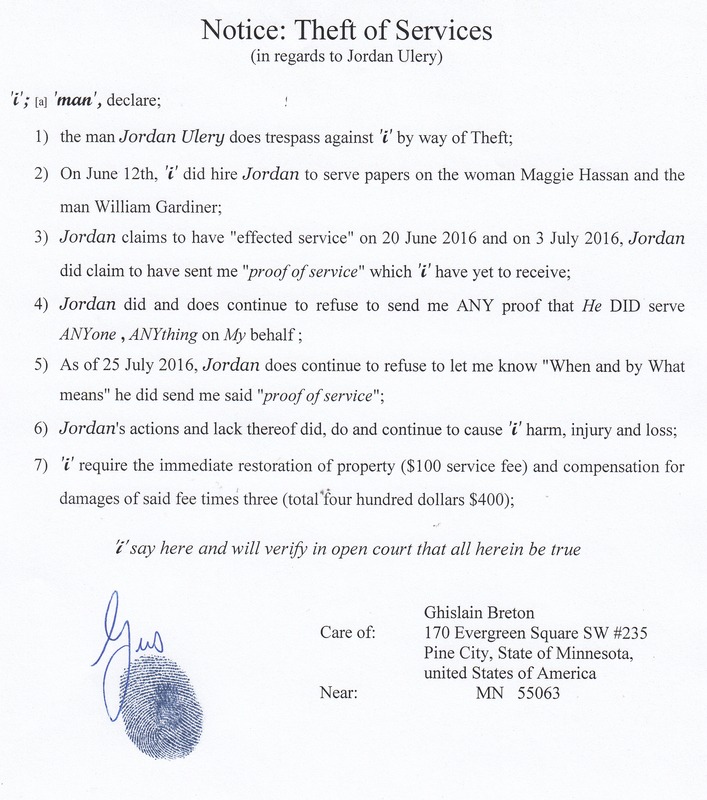 You’ll see below that Jordan claims to have “effected service” on June 20th, 2016. You’ll also see that Jordan repeatedly refused to send me any “Proof of Service” or to even tell me When and by What means he might have sent me said proof. When you consider “Proof of Service” is but a single piece of paper stating under oath that YOU gave a man or woman “papers” on behalf of another, you’ll realize I was not really asking for a whole lot. When You consider Jordan could have simply sent me a duplicate original if the first one had somehow gotten lost in the mail, you begin to realize there is not much that is honorable about a man that takes your money and then simply chooses to ignore You. We’ve put a 40 minute presentation together to inform the people of NH about the Article 31 Redress process and we would be happy to present it to any group willing to learn about Article 31 redress. I heard from a friend you were a process server and i could use your services. Is this something you still do? Except for NH divorce which has to be done by a sheriff. I moved to Minnesota in October and wish to serve Maggie Hassan. How much would you charge and how would i get you a copy of the papers. Would email work or doI need to get you Duplicate Originals? I sent Maggie a simple letter by U.S. mail last week seeking her assistance to clear up a Child Support issue but i have no way of knowing if she received it. I would like to serve her with it just to insure she does get a copy. I also sent a letter to attorney Susan Brisson regarding the same matter and have no way to verify if she did receive what i did send her. I wish to have them both served to verify delivery. Is this something you can do in the next few days? Here’s a copy of what i did send. i’m simply trying to resolve an issue without having to travel 1500 miles to back to NH. yeah, Send to jordan.ulrichlitigation@comcast.net so I can print them. What would you charge to serve them? Sounds good. I’ll put a cover letter together and get everything out to you tonight. i’m done for the day, i’m going to rest and write the cover letters when i wake up later tonight and I’ll put a check in the mail tomorrow afternoon. Has the check come in? I should probably send you another check this week to cover more service in the near future if your willing to serve the Chief Judge or Head Clerk at the Manchester District Court on or about June 23rd. Please let me know if you have not yet served William Gardner that i may just send him the letter by express mail. If so .. just hold onto the $50 til next week. Please call me with in the afternoon with an update – i really need to know what’s going on. service was effected on the Deputy Secretary of State, Bill was in a meeting, and upon the personal secretary for the Governor, she was out-of-state raising money for her Senate run. When/How do i get copies of service? I now need to serve Mary Barton, the Clerk of District Court in Manchester. Is there a faster way to pay you? I have much left to do before i am due in Court on June 29th and can’t afford any delays. Please let me know when and by what means i will receive a copy of the proof of service that i may plan the rest of my week. Jordan — I have yet to hear from You. When and by what means should i expect a copy ? Jordan .. have you sent me a copy of the papers you served on the 20th ? Jordan, i see you read my message this morning. Why have You chosen not to give me a simply answer? I’ve driving 40 minutes into town once or twice daily for NO other reason but to check the Post Office. I was there again last night and My P.O. Box was empty. Can;t YOU at least tell me whether or not you mailed Me what You served 10 days ago so i can at least know when to expect it? Dear Jordan, I was due in Court, in Manchester on June 29th. The reason i wished to have Maggie served was so i could enter Your Proof of Service affidavit into that Court Case before the 29th as an exhibit. On Saturday the 18th around 1pm, i let You know to NOT serve William Gardner (if he had not yet been served) because i was running low on time and wanted You to save the fee i paid You in Order to serve the Court the following week, but i never heard back from you til Monday morning. On the 20th at 5am Eastern Time i asked You to call and give me an update. You responded by NOT holding off on serving William and did instead let me know at 10:25am ET that you had effected service on William and Maggie. I asked then asked when and by what means i would get MY copy of YOUR Proof of Service to which You have yet to respond, despite my enquiries every 2-3 days since, and rather than answer me at all, YOU remain silent and i remain without said PROOF of SERVICE for which i paid You. As of today, July 2nd, at 1pm, i remain without answers as to why I am still without said Proof. I require of You return My property [$100] to Me forthwith. I have sent you your proof of service and this is the very first message I have received from you. Thank you. When and by what means did you send my anything? Jordan, YOU claim to have “effected” service on June 20th AND You claim to have sent ME a copy – – WHEN and by what means did YOU send Me anything? I have asked YOU this question a half dozen times in the last 2 weeks and YOU have NOT yet received answered ME, NOR have i received My “proof of service” which i needed for Court PRIOR to June 29th. I don’t understand YOUR repeated refusal to answer such a simple question .. AND, whereas this was an extremely TIME sensitive issue, I do require an immediate refund. Jordan, as You have now ignored Me for 3 days, I’m going to copy and forward You these FaceBook messages as PDF’s by email. For The Record: YOU have yet be provided ME with ANY evidence that You ACTUALLY did serve Maggie Hassan and William Gardiner on My behalf on June 20th 2016. Your unwillingness to even make Me aware of when and by what means YOU claim to have sent Me said evidence leaves Me wondering if You have been threatened OR if You really are this incompetent. Despite Your recent refusal to communicate with Me about this, it is still very difficult for Me to believe the latter. Please simply return Me the money i did pay You for Your Services that i may resume with the quiet enjoyment of My Life. 1) Why is it so hard to let me know WHEN and by WHAT mean you sent Me something? 2) Would it really have been THAT difficult to reprint YOUR affidavit and resend it to Me IF it had it been lost in the mail? 3) Couldn’t You just send it to Me by eMail? Out of respect, I will give You til Saturday July 9th to properly answer Me and clear this up before i publicly seek compensation for the harm and loss You did, do and continue to caused Me. I have yet to receive any answer from you as to why 1) you couldn’t send me MY “Proof of Service”, or 2) simply print and send Me another page/copy if it was lost, or 3) why you’re unwilling to refund me, or 4) Why You chose from the beginning to just ignore me. Is this REALLY how you wish to leave this? I see You did access that last message the same day i sent it — yet 6 days later You afford Me Not even one answer to a single question i did ask YOU over the last 3 weeks? I had so much more faith in You than this. I never figured You for a “take the Money and Run” kind of Guy. Contrary to 18 USC 241, You Jordan, did, do and continue to Conspire against and to deprive Me of the free exercise of My Right to the quiet enjoyment of Life. i have yet to receive My refund for the services You failed to provide Me, nor compensation for the damages You did cause Me by way of said failure. i also have yet to receive from You an explanation for Your failure to simply provide Me a Duplicate Original which would have cost YOU but the price of single stamp. You truly are disappointment and it greatly concerns Me that You are considered Honorable in any way by the Public.